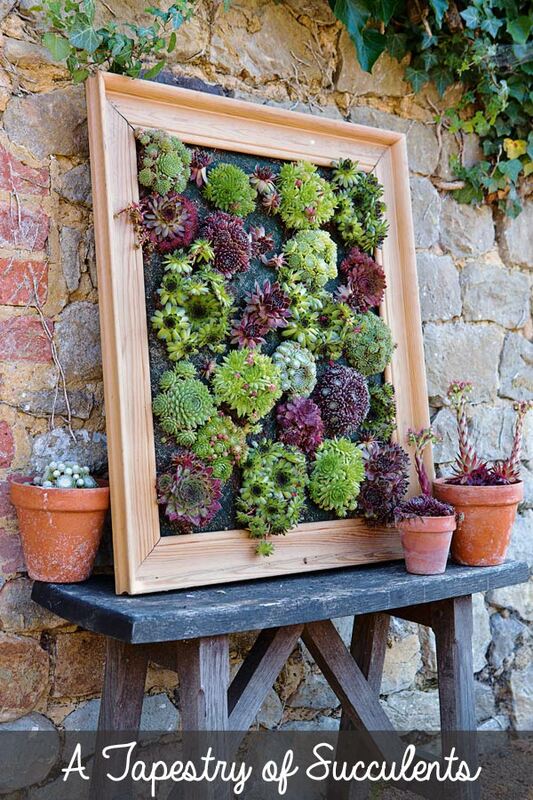 Here’s a bunch of ideas for displaying succulents in your garden. 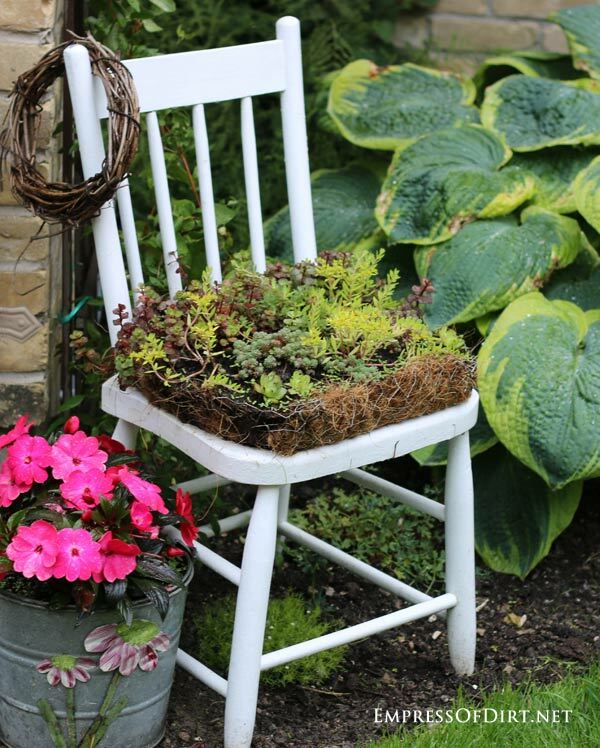 From wreaths to tackle boxes to old boots, you name it, succulents can be planted there. If you want to grow more, see how to propagate succulents. 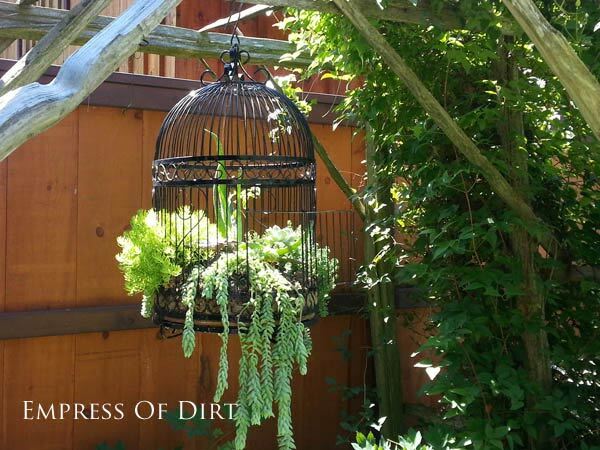 Vintage bird cages make ideal succulent planters, especially the ones with the wider door openings so you can reach in and the plants can spill out. This one was created by Susan StLouis of Goderich, Ontario. This has detailed instructions on how to turn a birdcage into a hanging garden planter. Want to make babies? 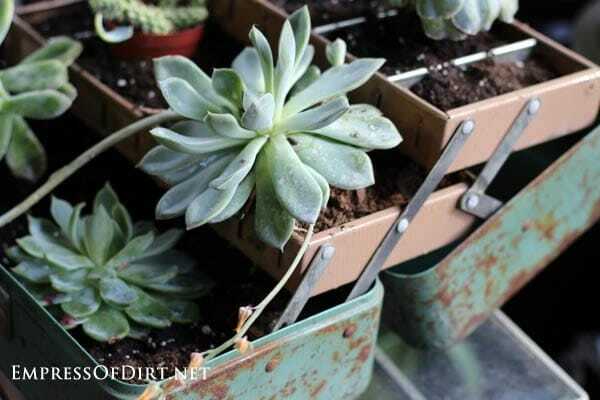 See how to propagate succulents from the ones you have here. You can make this! 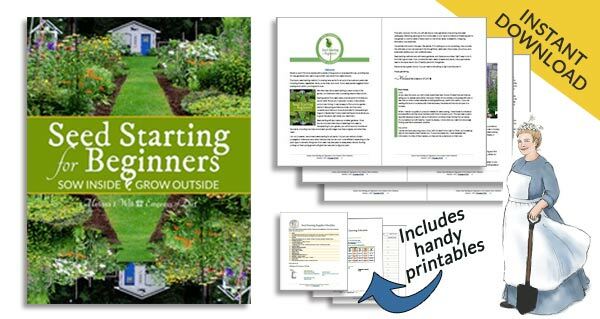 The complete tutorial from Gardening on a Shoestring is here. How beautiful is this? 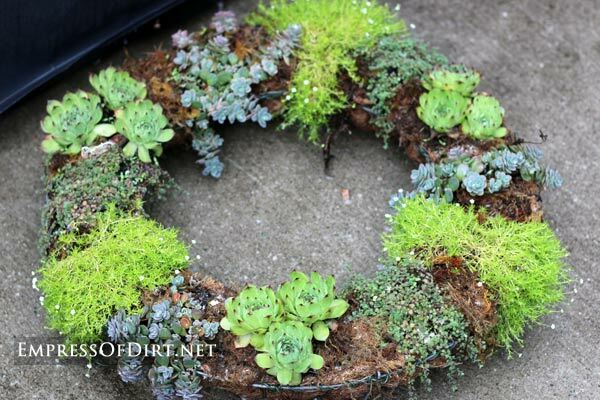 With a patchwork arrangement of succulents and moss, wreaths like this are gorgeous in the garden. There’s a few options for assembling succulent wreaths. Most start with a metal wreath form. A leg of pantyhose (yes, you heard me right) threaded onto the wreath form with small cutouts where you want to insert the plants. As the plants grow, the wreath fills in, becoming gorgeous and lush. 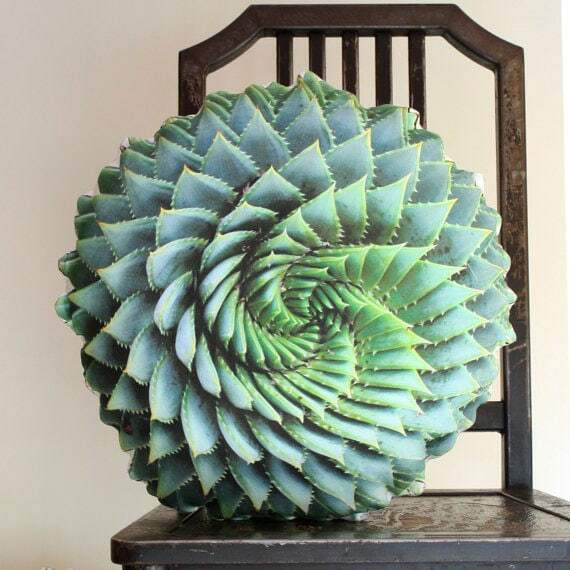 I adore this Succulent pillow by Plantillo on Etsy. 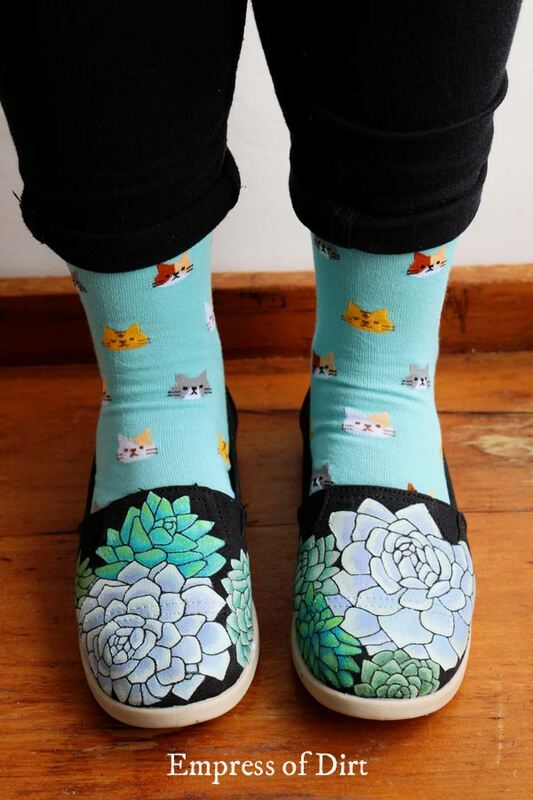 Have a look at the shop to see more options including a giant cacti and more. There are lots of small-scale plants that look great in fairy gardens, and succulents like these ones with tiny flower-like buds are a really easy choice. 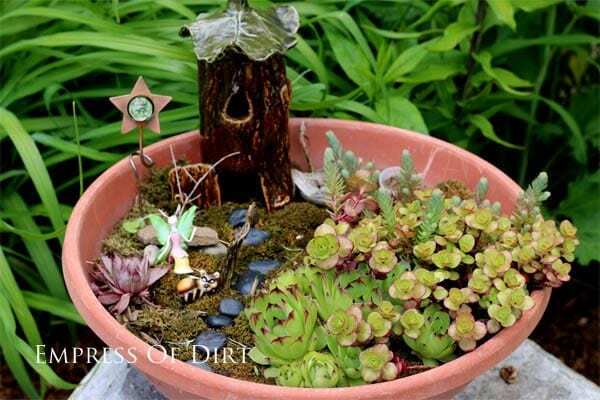 There are lots of fairy garden how-tos and project ideas here. 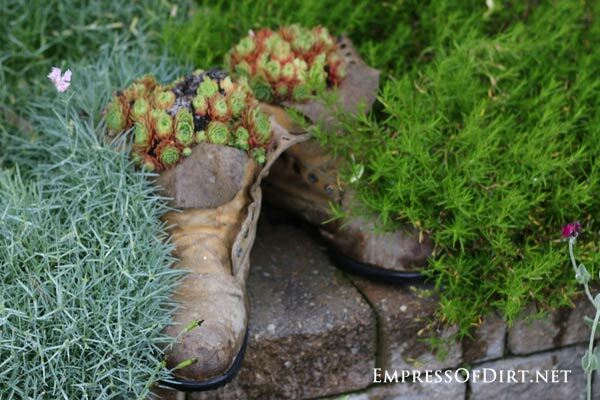 These projects from creative garden bloggers will have you growing succulents in unexpected and fabulous places. Are you on Team Rust or Team Paint? For me, it depends on the item. I noticed this fishing tackle box at a yard sale and knew I had to have it (50 cents). The old paint colour and patina just grabbed me. When I bought the old, folding stool at another sale, the vendor said, I bet you’ll have that painted before you get home. But nope, I love it’s rusty-peely self just as it is. The tackle box is the summer home for some of my succulents. I’ll move them to another pot when they come indoors for the winter. 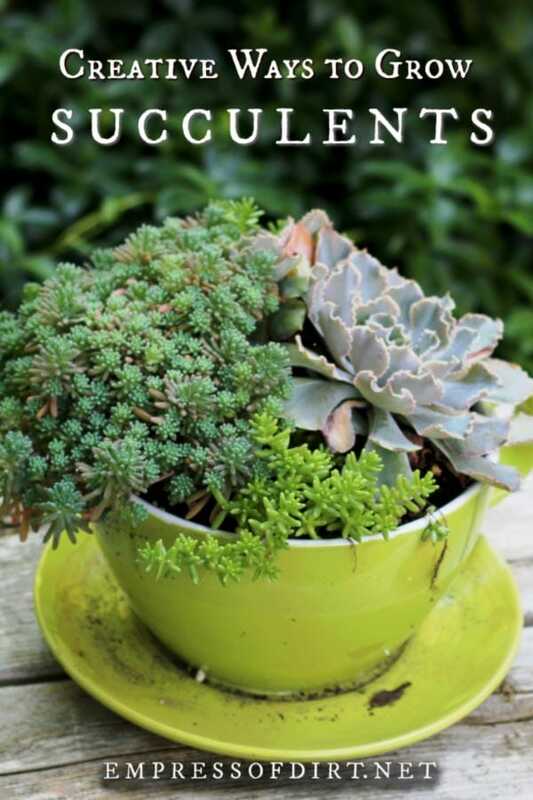 Make sure you always use container soil made for succulents (or prepare your own) for healthy, happy plants. Succulents produce a lot of babies. It’s always good to have containers ready so you can pop them in a new location and give them room to root and grow. 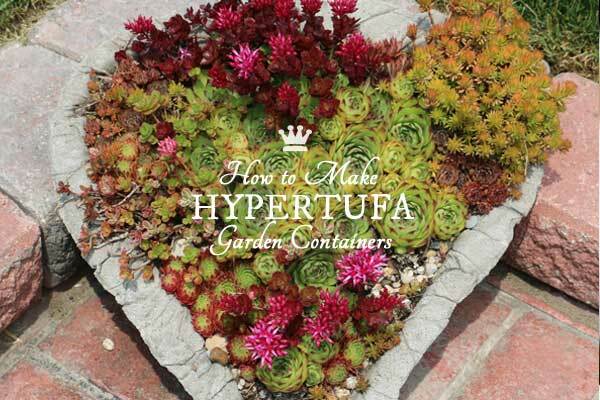 See how to make hypertufa containers here. Yes, I am a watering can fanatic. Occasionally I get so consumed with planting them, I find myself without a good one for watering the plants! 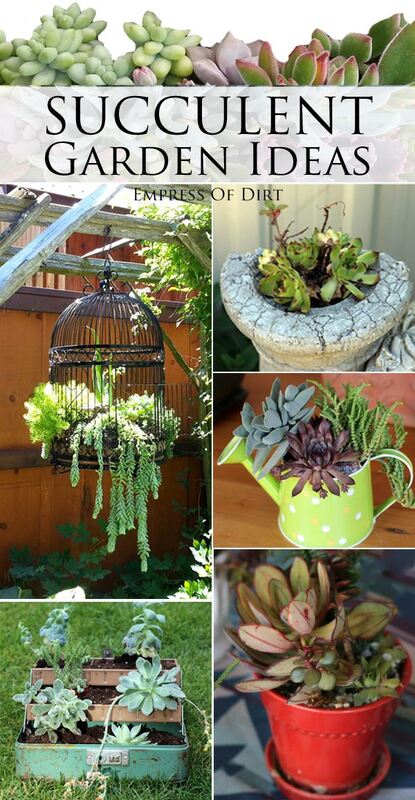 There’s lots of watering can garden art ideas here. I saw this chair on a garden tour. Chicken wire and moss are used to hold the plants in place. You can see more details and ideas here in my Gallery of Garden Art Chairs. This photo isn’t the greatest but I wanted to show this idea. 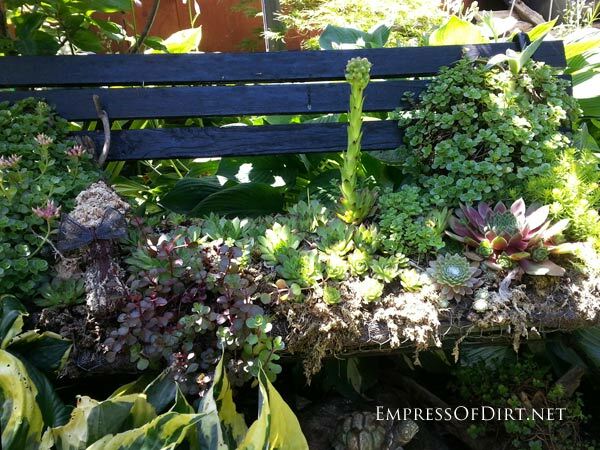 This old garden bench is planted the same way the chair (above) is: chicken wire forms the outer support for the moss, soil, and succulents. It’s a fun idea for a rickety old bench. 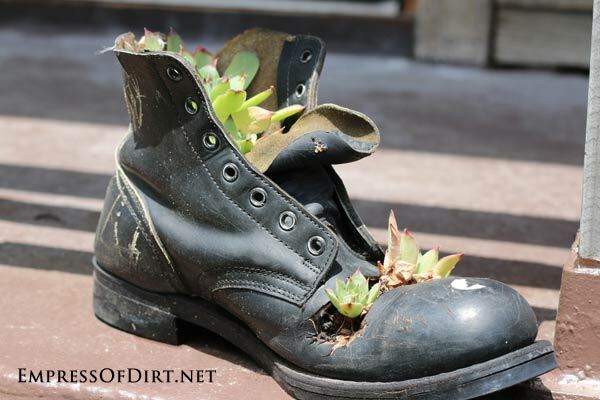 I think I see a planted boot or shoe in just about every garden I visit. I’m particularly fond of the ones that use crazy, older shoes. 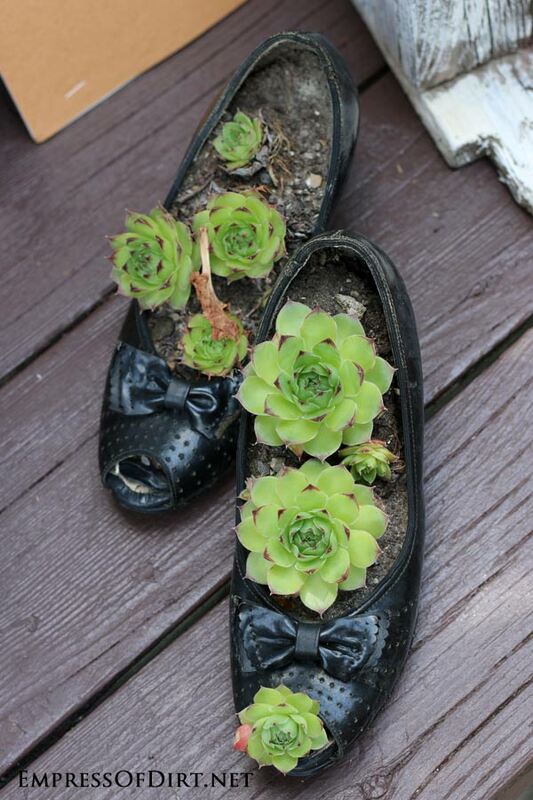 You can also paint your own succulent shoes. Here’s the instructions. You can see planted skates plus a whole bunch of creative garden container ideas here. 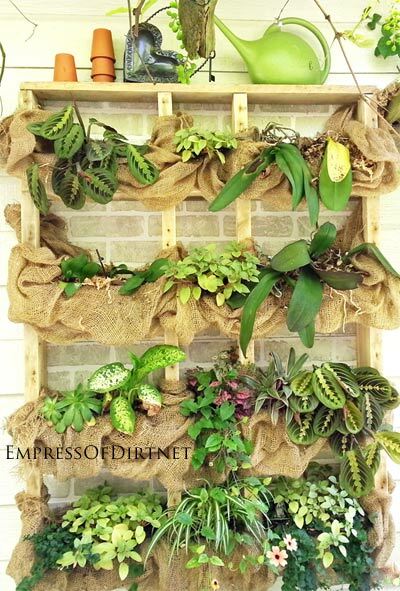 Take apart a wood palette or use 2×4 lumber to build it: a DIY outdoor plant shelf like this one can store a lot of plants on a wall. If you like to keep tropical plants and succulents outdoors in the warmer months, this a a great way to display them plus it’s easy to do all the watering. 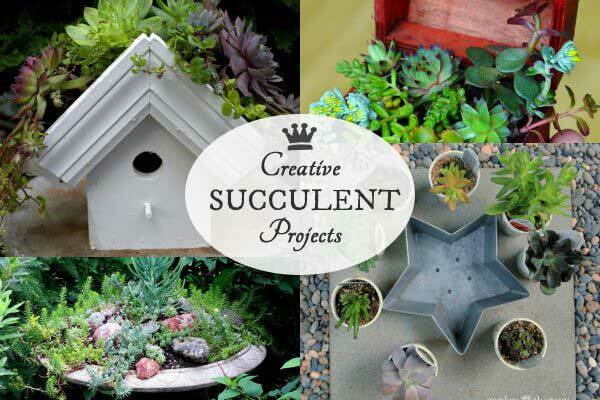 Are you ready to make some succulent garden art? 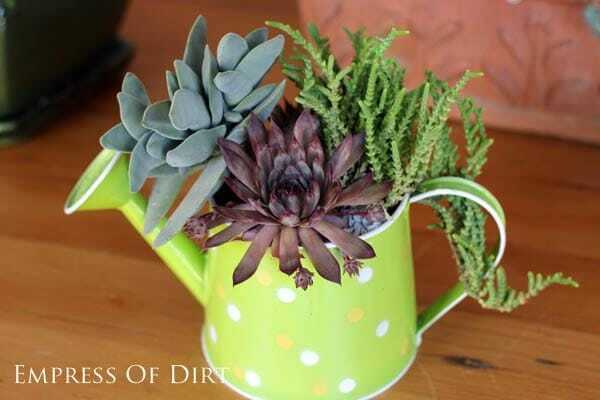 I love the watering can idea. That is a smart way to add a little extra decoration to your garden. Thanks for the post, I will keep these ideas in mind! I got so many great ideas from seeing this I am going to have to go hit the thrift stores for old boots and bird cages now…seriously loving the birdcage! Thank you, Sharon. That’s very kind of you and we’re delighted to have you on our garden adventures.